Across India on 5th September, children report to school as usual but classes are replaced by activities of celebration to show appreciation for teachers. 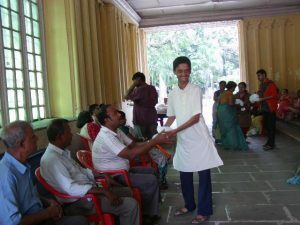 Events took place at all the CRS Education Centres including the Training Center for Differently-abled Persons (TCDP). The young people with different physical and mental disabilities normally learn skills such as chalk making and book binding. But Teachers’ Day provided them with an opportunity to thank their instructors, give them gifts and entertain them with dance. The students were also watched by their carers, usually their mothers, many of whom travel some distance to attend the TCDP. They greatly value the opportunity that the CRS Centre gives to nurture their children in a positive atmosphere.